In March 1988, two years before W.G. Sebald’s book Schwindel. Gefühle was published, an early version of the first chapter appeared in Manuskripte: Zeitschrifte für Literatur 99. Titled Berg oder das…, this piece is devoted to the French writer Marie Henri Beyle (better known as Stendhal, the name he used as an author). After nearly twenty years of writing about literature, this was the one of first times that Sebald had ever published a piece of his own prose fiction. When my copy of Manuskripte arrived from a used book dealer in Germany I did a quick visual comparison between the periodical version and the book and found several differences. But one change immediately caught my eye. On page 16 of Schwindel. 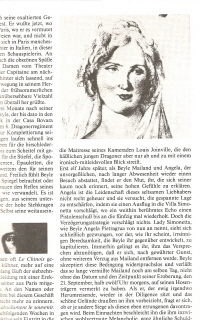 Gefühle (Vertigo in English), Sebald includes a portrait of Angela Pietragrua, one of the important loves of Stendhal’s life. Surprisingly, in the Manuskripte version, the overlying grid is missing. In Schwindel. Gefühle, the first chapter is titled Beyle oder das merckwürdige Faktum der Liebe (which became Beyle, Or Love Is a Madness Most Discrete in subsequent English editions).In the course of a few sentences, Sebald summarizes the relationship between Beyle and Pietragrua as a belatedly requited love affair that led Beyle into a sustained melancholy. 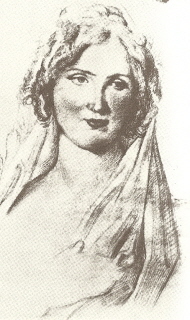 Stationed with Napoleon’s army in Milan in 1800, the 17- or 18-year old Beyle fell head over heels for Angela Pietragrua, the current mistress of one of his fellow soldiers. But he could not bring himself to confess his passion to her until he returned to Milan eleven years later. However, when he visited her in 1811, still engulfed by his secret love for her, she didn’t even remember him at first. Undeterred, Beyle embarked on an ardent courtship and finally succeeded in becoming Pietragrua’s lover. And almost immediately, worried that his infatuation had ended at the moment of apparent victory, Beyle once again departed Milan. “As darkness fell, the now familiar melancholy stole upon him”, Sebald writes. Those two years of sighs, tears, transports of love and melancholy, which I spent in Italy, without women…have undoubtedly given me this inexhaustible source of sensibility which today, at twenty-eight years of age, makes me feel everything down to the smallest details. 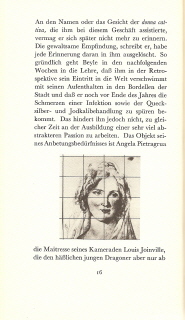 Sometime between the publication of the Beyle section in Manuskripte and its appearance as the opening chapter in book form, Sebald took a ruler and drew a simple grid across the face of Angela Pietragrua. The anonymous portrait – actually the “presumed” portrait – of Angela Pietragrua looks like a charcoal sketch, which Sebald obviously photographed or photocopied out of another book. The lower portion, which Sebald cropped out, shows a continuation of her shawl and what appears to be an unfinished hand. Artists, of course, draw a grid over a sketch to aid in the creation of the final painting. What was Sebald trying to suggest by this? Schwindel. Gefühle was Sebald’s first work of prose fiction and it clearly shows its status as a transitional work, halfway between the academic essays on literature that he had been writing for the previous two decades and his new liberated, experimental style. 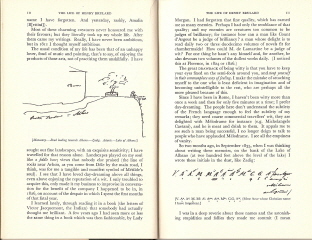 Here we also see Sebald figuring out how to embed images into his writing. He clearly didn’t want images to be illustrations, so he doesn’t use captions and he frequently leaves their relationship to the text uncertain. So it’s not surprising to find him still tinkering around between the version in Manuskripte and the book. The Angela Pietragrua episode is just a way station as Sebald heads toward what is to him a more important destination. While this chapter is ostensibly about love, it seems that Sebald’s real point is to demonstrate how Beyle’s difficulties and failures at love converted him into a determined and great writer. After Beyle’s failure to win the next big love of his life – Méthilde – he “was inconsolable. For months he reproached himself, and not until he determined to set down his great passion in a meditation on love did he recover his emotional equilibrium.” Thus was born Beyle’s first semi-fictional book De l’Amour (1820). The grid that Sebald drew suggests that something about this image is unfinished or – more properly – ready to be taken to the next stage. The theme of love in its Romantic and its carnal versions ripples through Beyle’s major books The Charterhouse of Parma and The Red and the Black, where love is at the nexus of power, family, and society. Sebald’s addition of the grid is his way of agreeing that Beyle’s career as a writer can be traced back to his youthful infatuation with Angela Pietragrua. It was almost like drawing a target on her portrait.